I don't know about you but I've tried many different skin products in the hopes of finding products that treat just the right combination of thing for aging skin. Products that treat aging skin and give it a youthful healthy glow without making my skin look over moisturized and heavy the way some products do, and that leads to acne breakouts, something I don't particularly want or need to deal with. 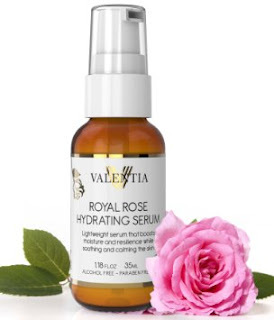 I've tried several products from Valentia and honestly I've never been disappointed Recently I had the opportunity to try Royal Rose Hydrating Serum and Eternal Youth Exfoliating Scrub by Valentia. Both are really nice products. Eternal Youth Exfoliating Scrub is a combination of all natural butters, olive butter,avocado butter, and kukul butter. All 3 of these help relieve your skin from signs of aging that leave it looking dull and lifeless. 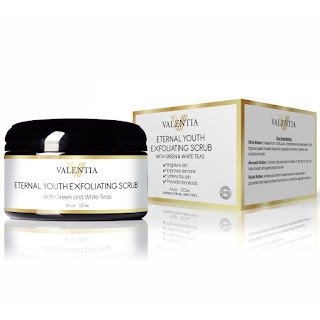 This formula is rich in nourishing vitamins, such as vitamins A, B1, B2, D, and E,all of these work hard to combat rough uneven skin and fight signs of aging. White and green tea have anti-inflammatory properties give skin a youthful glow. Jojoba beads gently exfoliate clearing away dead skin cells leaving healthy skin cells undamaged. The result is glowing tighter skin. The combination of these ingredients leave dry, sagging, aging skin looking brighter, younger and tighter. After cleansing your face with Eternal Youth Exfoliating Scrub and drying it, spray just a spray or 2 of Royal Rose Hydrating Serum on your face and allow it to absorb. It hydrates your skin beautifully with the combination of Rose Oil, Evening Primrose, and Rosehip Seed Oil. This is a light, non-oily that will never clog your pores and is perfect for sensitive skin. Lavender helps heal dry or sensitive skin, treating pimples wounds or sores. Bearberry with Vitamin B which is a clinically proven ingredient, helps fade away helps fade away skin discoloration, age spots, and reduce melanin production. Giving you a brighter complextion. I received both of these products for free in exchange for an honest unbiased review.